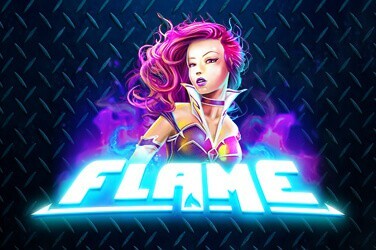 NextGen Gaming are famous for two things: creating irreverent and creative online slots and releasing them as part of global gaming powerhouse, NYX Gaming Group. 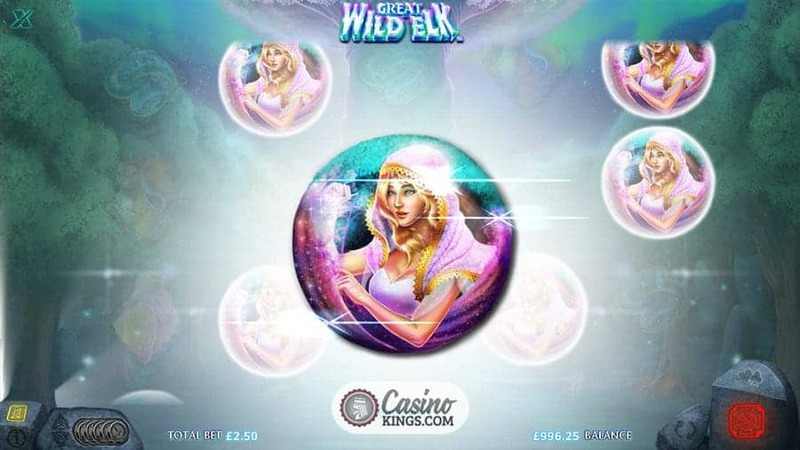 Great Wild Elk Slot is one such release, a five reel, three row, 10 pay-line online game. 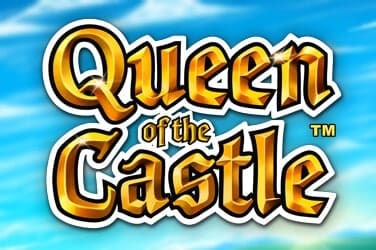 One that mixes mystical with mythical to create a slots experience that lives as long in the gaming session as it does in the memory. 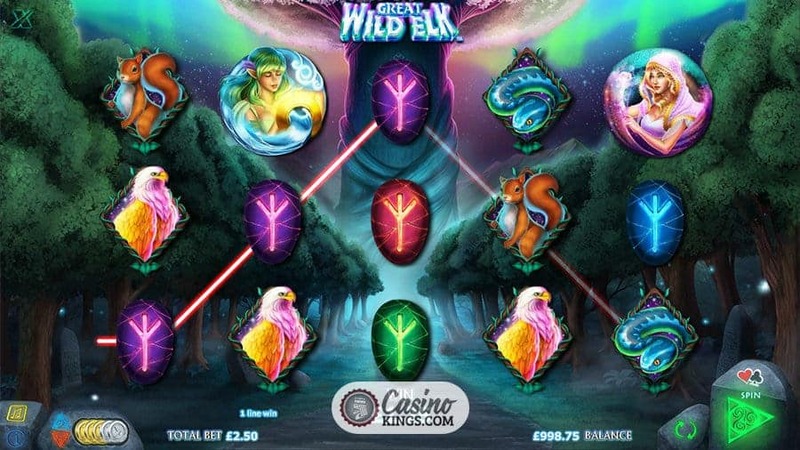 NextGen could have gone one of two ways with a slot titled Great Wild Elk. It could have chosen to develop a naturalistic slot, celebrating the nature and wilderness of these powerful creatures. Or it could have gone mystical and magical. We are happy to say that it has done the latter, bringing us to the enchanted wood in which we seek the Great Wild Elk. 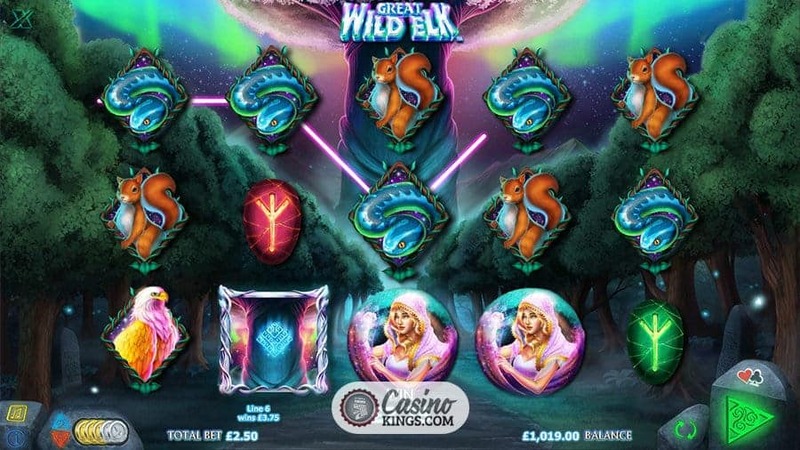 Our low-paying symbols are coloured magical Runes, while the creatures that populate this wood – the Snake, Squirrel and Eagle – make up a mid-tier of payouts. An enchanted Elf and a Spirit form our high-paying symbols, usually reserved for the likes of Scatters. Throughout the game-play we are treated to mystical twinkling music, to which we could easily imagine ourselves closing our eyes and being gently massaged by pixies. Did you perform a panicky double-take when we said there were two high symbols that gave out the kind of payouts usually reserved for Scatters? How, then, do we launch the game’s bonus symbols, if indeed there are any? Well, first of all, don’t panic. The Great Wild Elk will guide us. 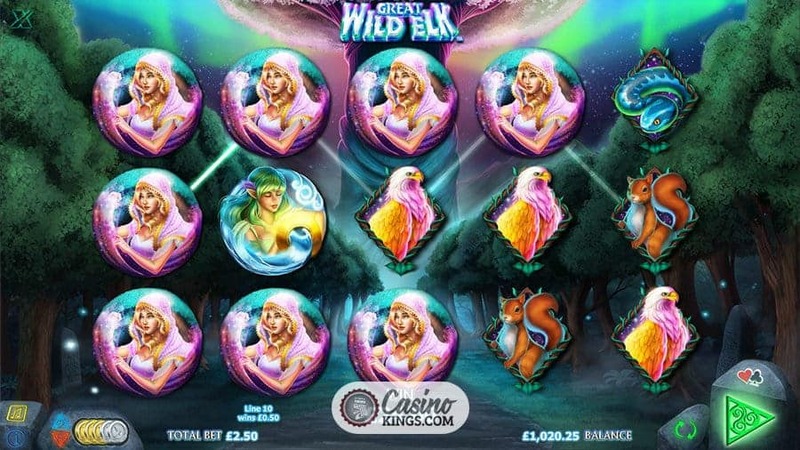 NextGen wouldn’t create a twinkling, magical, mystical online slot with 10 pay-lines without getting creative when it came to the bonus features. Our Great Wild Elk is the game’s Wild, appearing on reel 3 and performing all the miraculous substitution duties as normal. 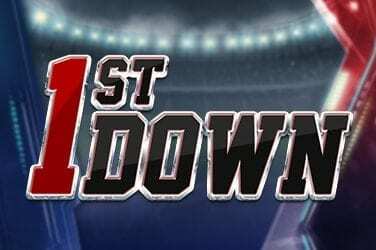 But in a wonderful twist any win in which the Elk takes part will launch the Free Games feature, in which we will be awarded between 4-10 free games. The Great Wild Elk remains in situ on reel 3 throughout the feature. This first Elk win is our initial Enduring Win amount, which we are awarded with every Magic Tree Scatter that lands during the feature. Every Elk win increases our Enduring Win value, and with the Elk staying put this gives our values a good hoof in the wotsits. 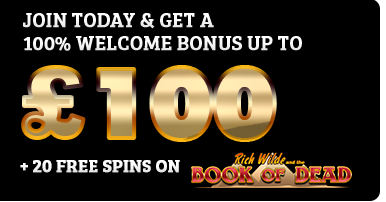 And as if to show off just how magical he is, the Great Wild Elk signals extra Re-spins at the end of the Free Games feature in the Call of the Elk bonus feature. These Re-spins continue until no more Tree Scatters appear. Oh, and at any point the Elk can transform the Runes into the Elf, Spirit, Eagle, Snake or Squirrel for a single spin in the Elk Light feature. This slot from NextGen and NYX leaves us as breathless as a barnstorm on a balmy summer’s night. 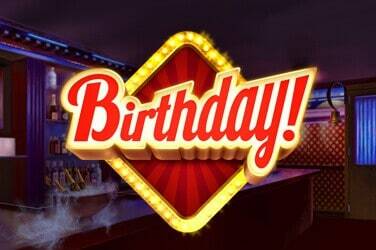 Or any night, for that matter. 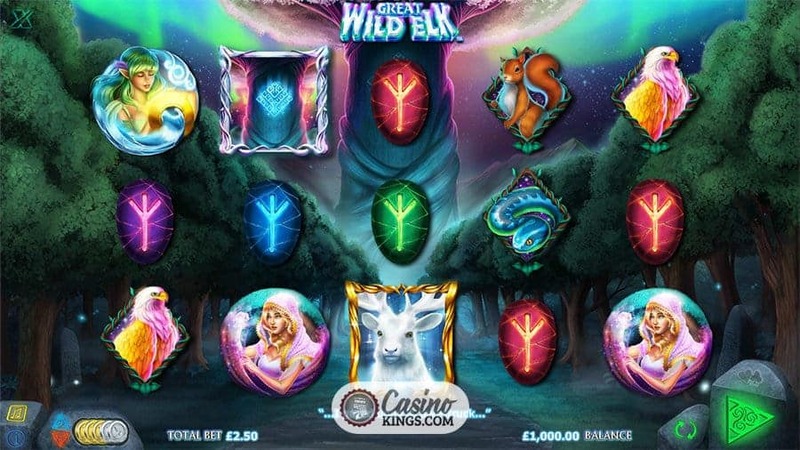 The ever-present Great Wild Elk ensures that base game wins are bumped into bonuses with medium-high variance, while the bonus features make the most of the magical theme. This title is a mythical, magical, mysterious winner.